Nacarat continued his fine record at Kempton by taking the Racing Plus Chase for a second time. 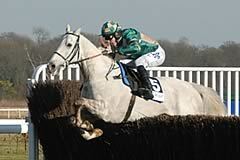 Successful in 2009 and placed in the last two years, the Tom George-trained grey ran out a popular winner of this three-mile handicap chase. Always prominent in the hands of Paddy Brennan, the 9-2 shot galloped on resolutely to beat Hector's Choice by 11 lengths, with Planet Of Sound third. George said: "We freshened him up and when the sun came out and it was good ground, that's what he wants. We just keep him happy, put him out in the field, and took him for a couple of outings just to keep him interested. He won't go to Cheltenham or back to Punchestown. "He could go to Aintree (Betfair Bowl) again, but it depends on the ground." Owner Simon Clarke added: "I'm a very lucky owner. He's given me some of the best days of my life. He loves it here - he jumps and he breaks other horses' hearts." Richard Lee, trainer of Hector's Choice, said: "It's always disappointing not to win but when conditions are like that, Nacarat is pretty much impossible to beat. He could go to Aintree, I suppose."